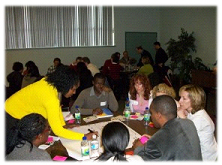 Almost 1000 church leaders, including about 200 senior pastors and representing 300 to 400 churches attended Faith at Home Ministry Training events in six locations across Canada in March 2010. Response was overwhelmingly positive and churches are now asking for more help in equipping their people. A new partnership developed in 2010 to make Faith at Home Ministry strategies available to more church leaders - that historic partnership was between The Leadership Centre Willow Creek Canada and Focus on the Family Canada. Now, Faith at Home Canada is a ministry of Family Life Canada, while still enjoying vital associations with our founding partners. The decision to do the Faith at Home Tour was a decision to step into two known arenas of God's blessing: helping churches to help homes. It is estimated that approximately 2000 Canadian church leaders have been impacted by the training of Faith at Home Canada, but there is more to be done! There is also a growing sense that God may be using the momentum in Canada to push this response and renewal movement called "Faith at Home" to other countries.